When using the Command-based framework Shuffleboard makes it easier to understand what the robot is doing by displaying the state of various commands and subsystems in real-time. Shuffleboard will display the subsystem name, the default command associated with this subsystem, and the currently running command. In this example the default command for the Elevator subsystem is called "AutonomousCommand" and it is also the current command that is using the Elevator subsystem. In Test mode (Test/Enabled in the driver station) subsystems maybe displayed in the LiveWindow tab with the sensors and actuators of the subsystem. This is ideal for verifying of sensors are working and seeing the values that they are returning. In addition the actuators can be operated, for example motors can be operated using sliders to set the speed and direction. 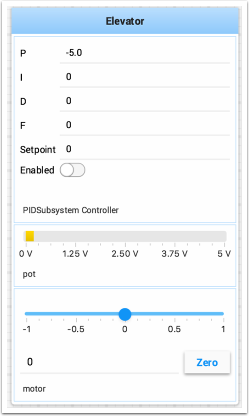 For PIDSubsystems the P, I, D, and F constants are displayed along with the setpoint and an enable control. This is useful for tuning PIDSubsystems by adjusting the constants, putting in a setpoint, and enabling the embedded PIDController. The the mechanisms response can be observed. Then the parameters can be changed, the PIDController re-enabled until a reasonable set of parameters is found. Shuffleboard will display the command name and a button to execute the command. In this way individual commands and command groups can easily be tested without needing special test code in a robot program. In the image below there are a number of commands contained in a Shuffleboard list. Pressing the button once runs the command and pressing it again stops the command. To use this feature the robot must be enabled in teleop mode.